Intro: Every once in a while, a particular Tarot Card will provoke poetry from me. I love it when it happens, and I wish I were able to interpret the entire deck in poetic form, but I’ll take what I can get. 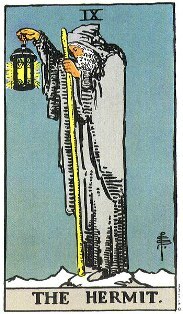 While this may not necessarily be considered an interpretation of the Hermit Card in the Tarot Deck, it does reflect how I feel internally when I see this card.